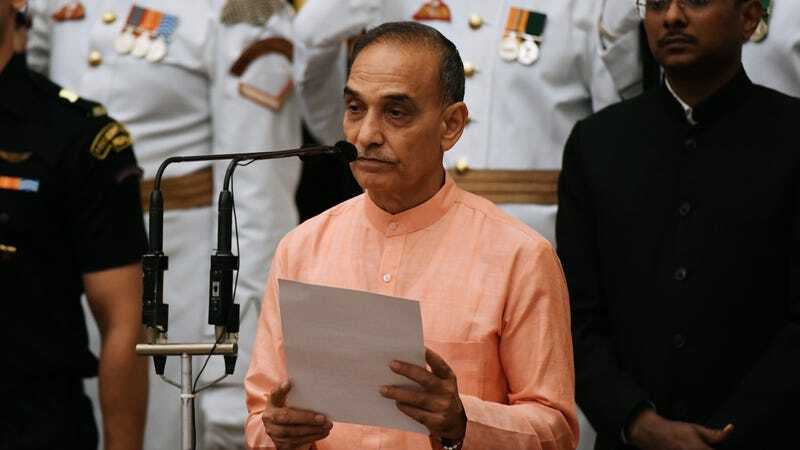 Scientists in India are in a furor following comments made by a junior minister who’s openly questioning the theory of evolution by natural selection. India’s Minister of State for Human Resource Development—a position that oversees university education—wants the theory of evolution to be removed from school curricula. Needless to say, this stance isn’t going over very well with the country’s scientists, many of whom are asking the junior minister to retract his comments. Singh, the former police chief of Mumbai and a chemistry graduate from Delhi University, said school curriculums need to change accordingly. A couple of days later he suggested an international summit be held on the matter. The situation ramped up a notch when Indian science minister Harsh Vardhan, a medical doctor, passed up an opportunity to comment on Singh’s remarks, claiming that he hadn’t read Darwin since he was a student and that he’s not qualified to speak on the subject—this from a science minister. Senior government officials later dismissed the comments. On 23 January, Singh’s boss Prakash Javadekar, the senior minister for human-resource development, said that he had asked Singh to refrain from making such remarks. “We should not dilute science,” Javadekar said. He added that his ministry would not support any anti-Darwin activities such as Singh’s proposed conference or changing curricula. Singh did not immediately respond to a request for comment from Nature’s news team. In addition to this, an online petition demanding that Singh retract his comments was launched, collecting more than 3,000 signatures before it was closed on January 24. Three different Indian science academies also chimed in, saying the removal of evolution from school curriculums would be a regrettable step back. The quick reaction from both scientists and politicians is encouraging, but the damage may already be done, with the pernicious anti-evolution meme now taking root in what is fertile ground. Last year, an astrology workshop was planned at the Institute of Science in Bangalore, raising the ire of the Breakthrough Science Society. The event was ultimately canceled, but the incident demonstrated the degree to which unscientific, and even pseudoscientific, ideas are propagating among Indian politicians, policymakers, and the public in general. Last year, Turkey announced that evolution will no longer be taught in its schools, claiming that it’s “debatable, controversial, and too complicated for students.” Given the recent events in India, these are now worrying trends. Which is completely crazy. Darwin wrote On the Origin of Species nearly 160 years ago, and the evidence for evolution by natural selection has only gotten stronger over time. But unlike other scientific disciplines, evolution hits religion where it hurts the most, offering a powerful scientific explanation for humanity’s origins in the absence of a supernatural creator. Darwinian natural selection is often construed as a veritable god killer, and as such, it’ll always be subject to attack.